Sgt. Bradley Atwell, left, and Lt. Col. Christopher Raible were killed when insurgents attacked Camp Bastion in Afghanistan on Sept. 14. The Washington Post published a noteworthy story this morning revealing new details about the deadly Sept. 14 attack on Camp Bastion, a British facility in Afghanistan’s Helmand province that abuts the Marine Corps’ principal hub there, Camp Leatherneck. When it became clear Bastion was under attack, Raible threw on body armor and jumped in a vehicle with [one of his deputies, Maj. Greer]Chambless. Because his rifle was not nearby, the commander charged into the combat zone armed only with a handgun. The two men exchanged nary a word during the short drive as they scanned the landscape for insurgents. When they got to the flightline, Raible dashed into a maintenance room and began barking out orders to the Marines who would soon push the assailants back. All but one of the 15 attackers were killed by coalition troops. At least one group of five was taken out in an airstrike, according to Londoño’s report. One man was taken into coalition custody. 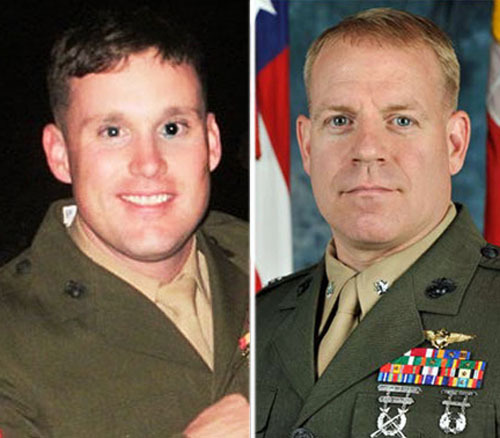 Semper Fidelis, you fought like Marines and died heroically. God Speed Marines! You epitomize what it means to say you’re a “Marine”. Semper Fi Marine! HERO’S / Great men, protecting a great cause and the Greatest country, I feel I must apologize for the very weak back home starting with a non-committed president, I respect the office, simply not the man, a man who believes in a different vision of America, 1 that does not align with our founding fathers and any/all patriotic father to this day. Service men I pray for you and pray it wasn’t this way. what a cute guy, he shouldve been well protected!